Would welcome an update (identity) of this one: a Beech D18S, probably c/n A-72, currently (2017?) 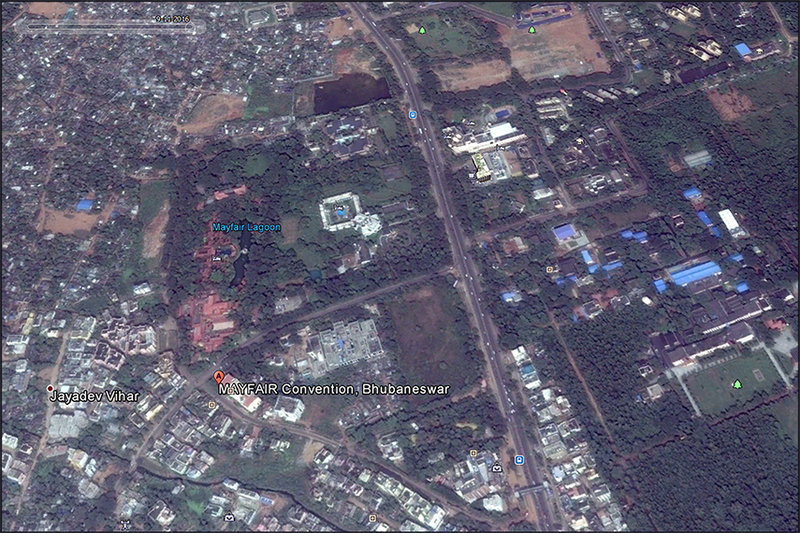 at the Mayfair Hotel & Restaurant, Bhubaneswar, India. A.k.a. 'Mayfair Convention'. Google Earth, map dates from 2016; aircraft is displayed inside the Beech 18 at Mayfar Hotel & Convention Center. EC-47Q 49-570 (c/n 26831/15386) - Yeouido Park, Seoul, S K (22Sep2016) - NOTE Grant Newman's photo below! 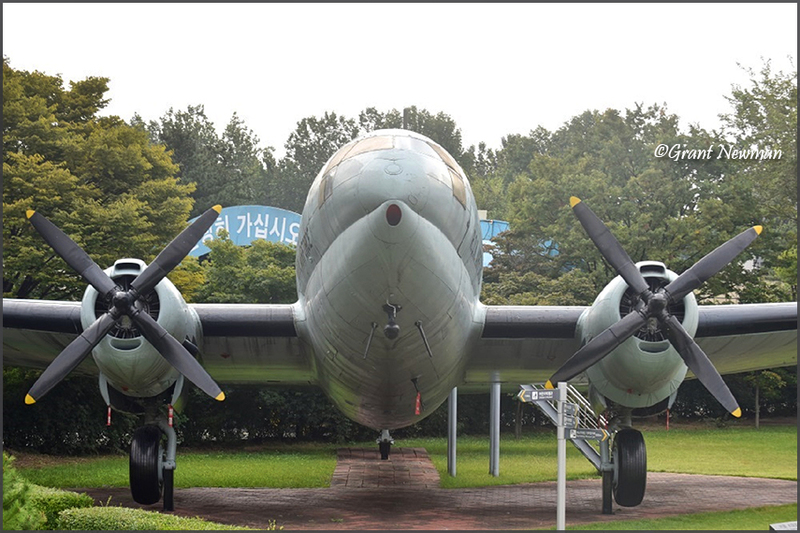 Grant wrote: "...a curious C-47 looking incongruous in the middle of Seoul! It is located at Yeouido Park on the south bank of the Han River which flows through the city. The text below the platform on which it sits is, unfortunately in Korean, so I can’t provide any further information." Grant sent the following images Dec.2017, and he wrote: "I can add a couple of photographs taken in Seoul, at the excellent War Memorial of Korea and at Boramae Park. C-46 is CW-20B-2 RoKAF 10541 msn 22364, the C-123Ks are RoKAF 389, msn 20273 and RoKAF 40622, msn 20071, the C-119G is USAF '3199' (although I question the validity of this), msn 10739. 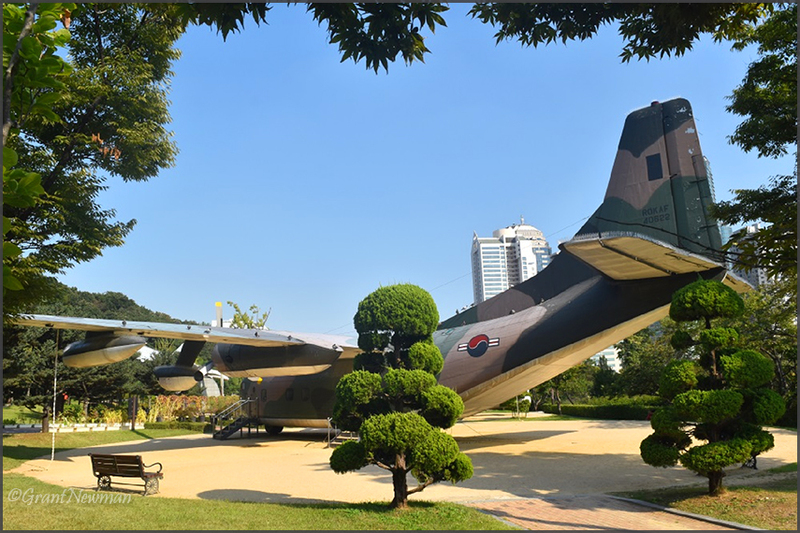 The C-119G, C-46 and C-123K 389 were taken at the War memorial, whilst the C-123 40622 was taken at Boramae Park. The pictures taken at the War Memorial aren’t the clearest, the day was overcast and muggy. Here’s a link to more of my pictures taken at Boramae Park: www.flickr.com/photos/147661871@N04/albums/72157688913521161 "
From my (RL) files: 'During May or June 2005 resprayed and also changed registration to 10-541. 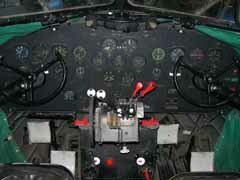 Note the wiring on top of the fueltank, to prevent birds pauzing and shitting the C-123. I came across a link from Facebook (july 2015) to a Japanese website, FlightGear, which showed this yellow Twin Beech on a pole in a parking lot. 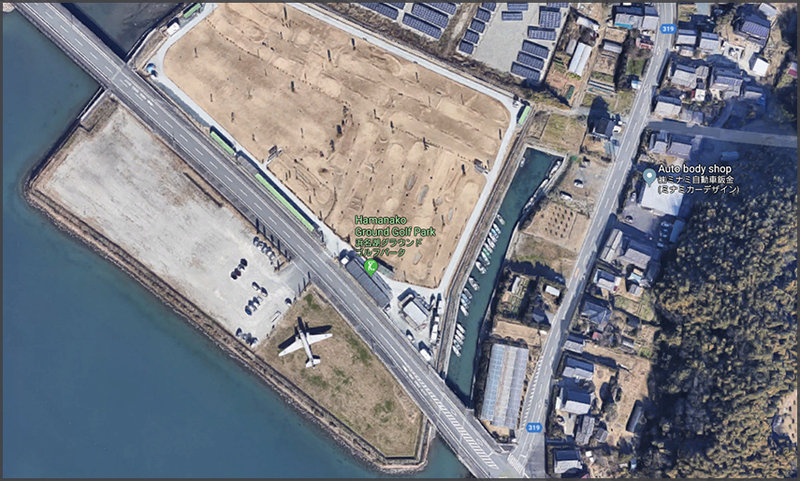 Well, my Japanese is kinda rusty but from the images, which include an empty parking lot at the bottom of the page, I gather this Twin Beech is no longer there. It was showing sign of damage by wind & weather, but no cause for destruction. So where did it go? I think these images date from 2006, as that was readable, and an adress Higasu-Ku, Kumamoto City; but not sure if that is the (former) location of this Beech 18. "It's G18S JA5503 (c/n BA-551). 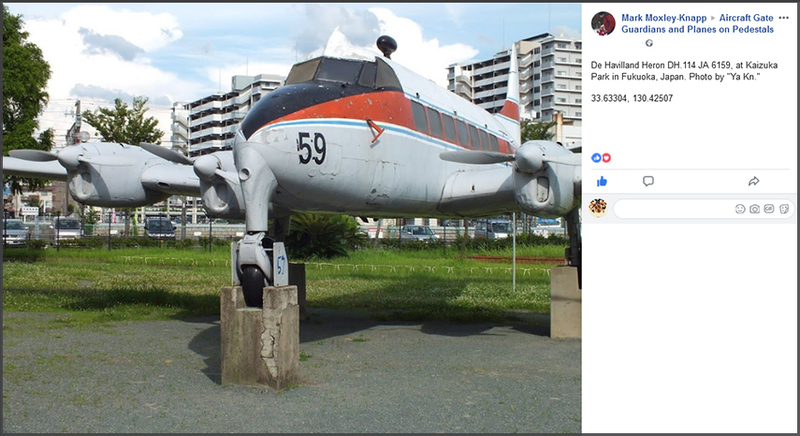 A bit of Googling, plus use of Google's translation engine, has ascertained that the aircraft was sold by the Japan Coast Guard to a Mr Kenichi Azuma in 1981 and initially displayed on the roof of a hospital in Kumamoto City. In around 2004 it was moved to the premises of an aviation hobby shop, owned by a Mr Fuku (apparently) in the same city. The business closed in May 2007. 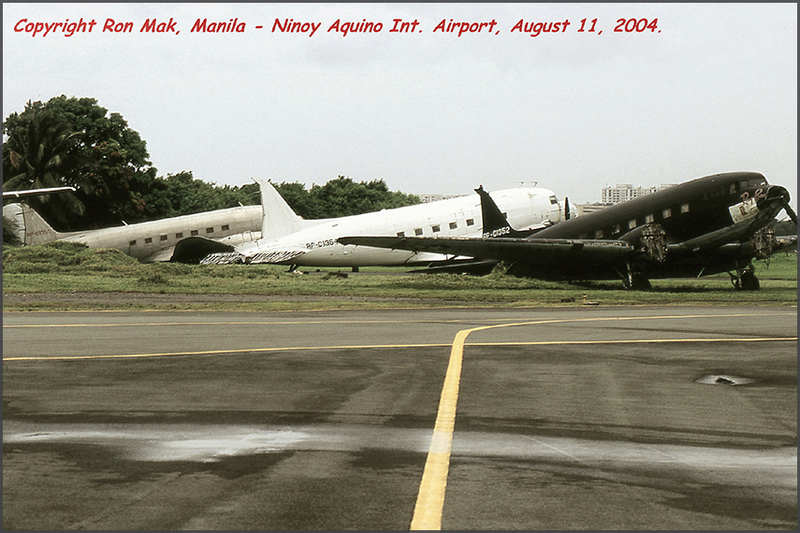 The translation isn't entirely clear, but it suggests that the aircraft had already gone by 25 May (2007 -Webmaster), the copious amounts of yellow paint on the ground indicating it had been cut up. 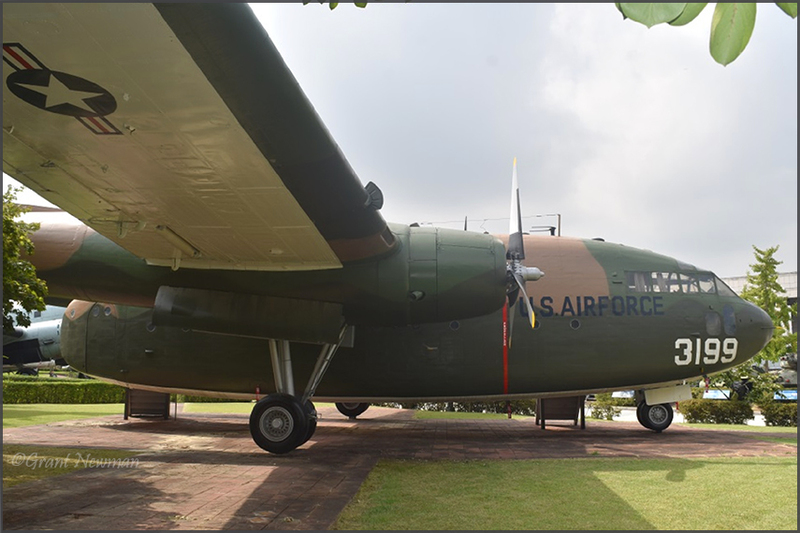 JA5503's sister ship JA5505 (BA-617) was acquired from the Coast Guard by Mr Azuma at the same time as JA5503, and donated to the Kumamoto City Museum where it remains on display." Completed 1960. Sold new to Chu Ito, Tokyo, Japan reg’d 10Nov60 as JA5503. Maritime Safety Agency, Kagoshima 1960 to Feb71. To Ken-ichi Azuma (famous Japanese chef). Registration canx 18Apr81. On display. Translation of the Japanese text in the website seems to say: 2004 on display in Kumamoto City flight gear shop. May 2007 the shop closed & plane gone. Last note in the top entry is Aviation History Museum. Could final caption translation read that plane was cut up (lots of yellow paint chops on ground near the shop) & dismantled." 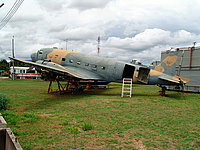 He wrote: "...here are some photos of C-47 JA5019 taken June 2007. Some of these are additional to those I placed on MyAviation. The nose of C-47 JA5019 is inside the foyer of All Nippon Airways maintenance offices and hangars at Haneda, Tokyo. This aircraft, MSN 4247 [41-7760], had previously been in a children's playground since the early 1960's. I believe it was restored to its present condition in 2002 for ANA's 50th anniversary." 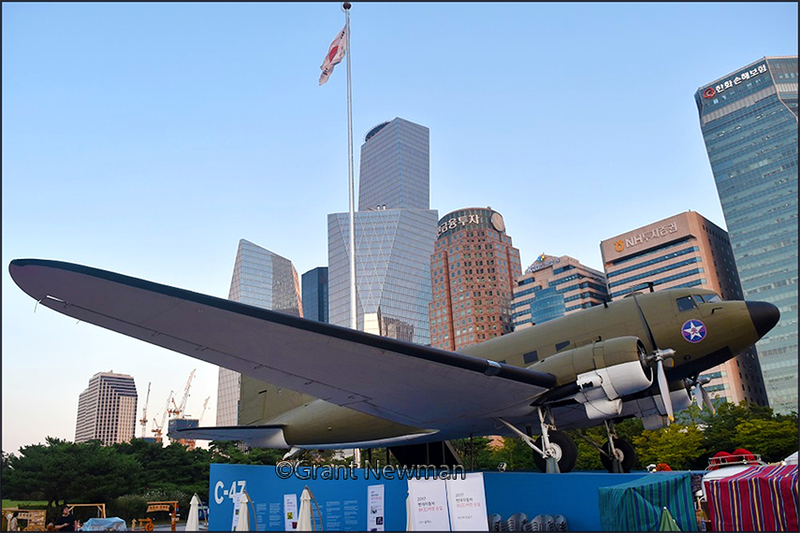 Stweart updated this in Jan.2012:"The ANA C-47 nose at Haneda was still on display December 2011." Stewart sent me this in Dec.2012, he wrote: "A more recent photo. 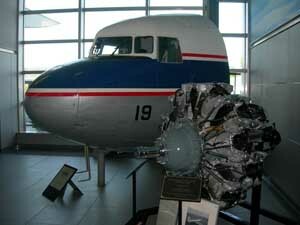 The engine previously displayed next to this nose has been moved across the road to the lobby of another ANA building, along with the Tristar procedures trainer." 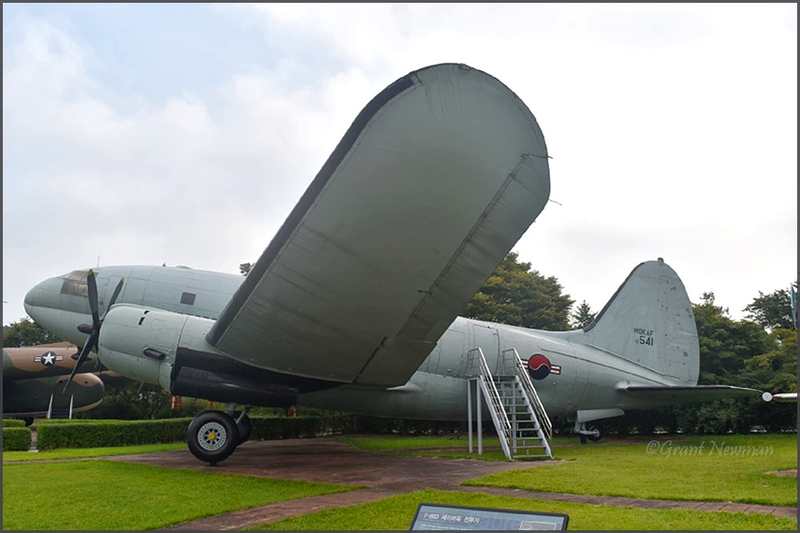 Douglas C-47D FL510 'Sister Ann' (c/n 25762/14317) preserved at Hamamatsu, Japan. Photo by KS-SJST Spotters. 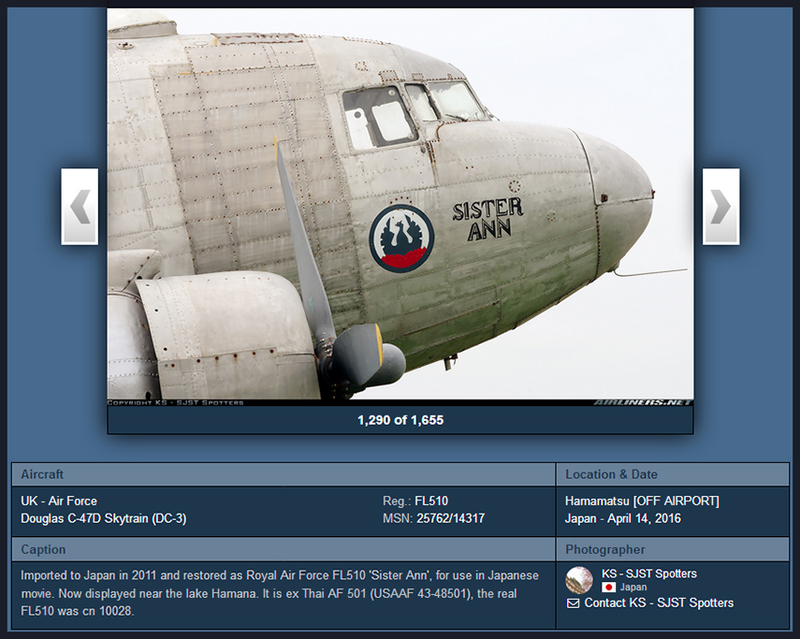 "Imported to Japan in 2011 and restored as Royal Air Force FL510 'Sister Ann', for use in Japanese movie. 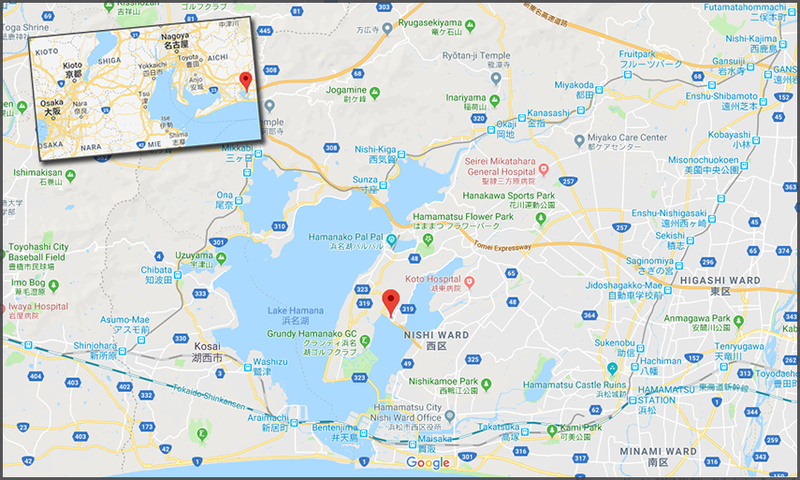 Now displayed near the lake Hamana. 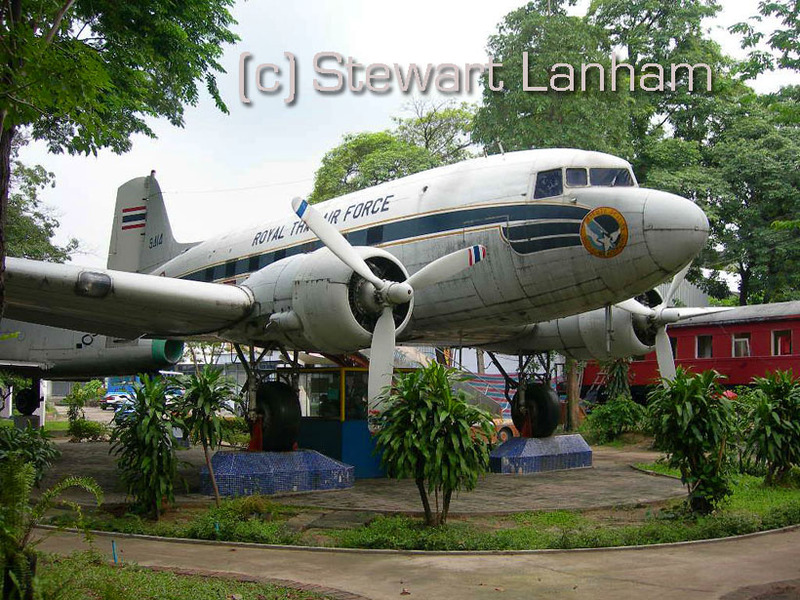 It is ex Thai AF 501 (USAAF 43-48501), the real FL510 was c/n 10028. @Hamamatsu, Japan." 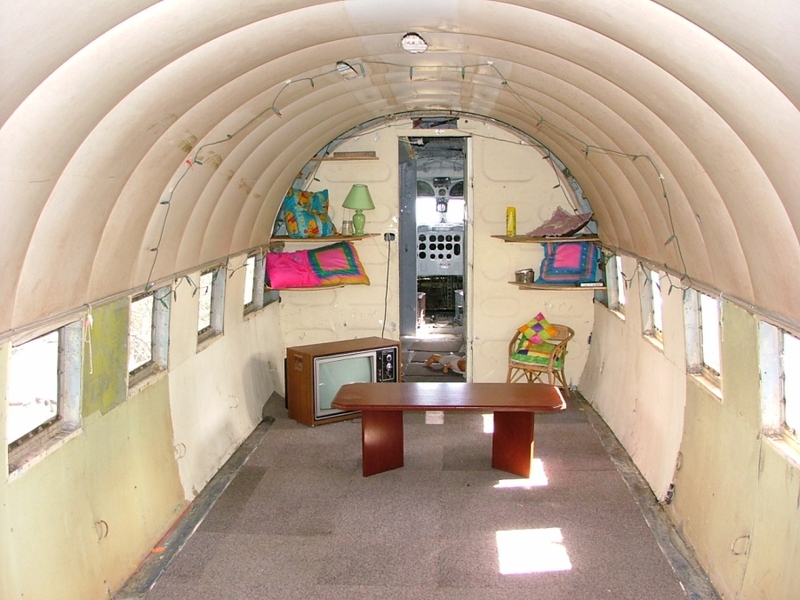 becomes part of somebody's man-cave..."
Sits in a rather forlorn place I would say. Was was it put in this dreary location? This is the first shot of this aircraft at its new home. 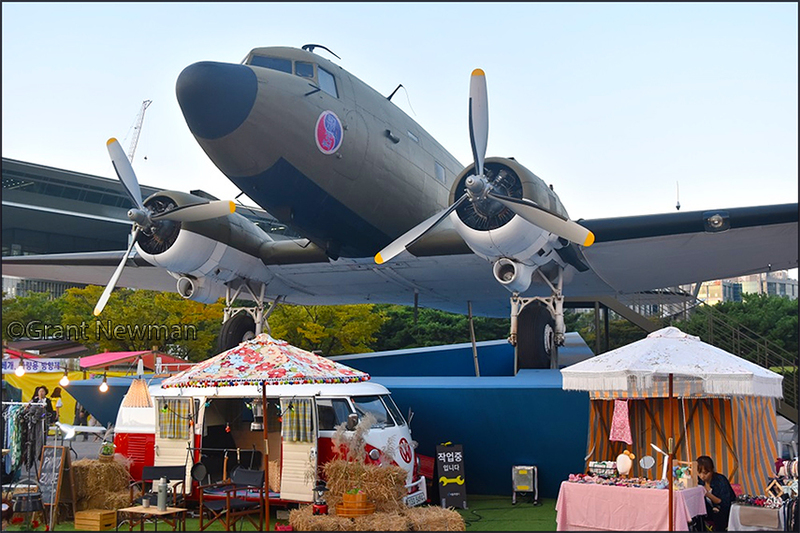 After flying for many years, this aircraft is now on display close to the Tokorozawa Museum, near the railway station. Photographer : Stuart Haigh (published with permission). My own notes say: JA8732 is on display Tokorozawa station (outside Koku-Koen). "De Havilland Heron DH.114 JA6159 at Kaizuka Park in Fukuoka,Japan. Photo by 'Ya Kn'. 33.63304 130.42507"
Willem Overtoom included this shot in his newsletter, which was quoted to me, while travelling in Cambodia in July 2008. He wrote (my translation): "I arrived at Sihanoukville, which I had visited 5 years ago too. It still isn't a city but rather a collection guesthouses, small hotels and a beach. There is no evidence of city planning, but there is a harbor, a cluster of streets, buildings.. And a few kilometers from there again some buidings, streets, small business and some governmental buildings. East of there more of the same... There is no city centre... A lot of walking if you don't have a motorcycle at your disposal! A few years ago the beach of Victory Hill underwent a sizeable reconstruction and resorts and hotels, even casino's have been built here. Next to the pier a hangar has been built; it isn't large enough for the Antonov 24 it accommodates... 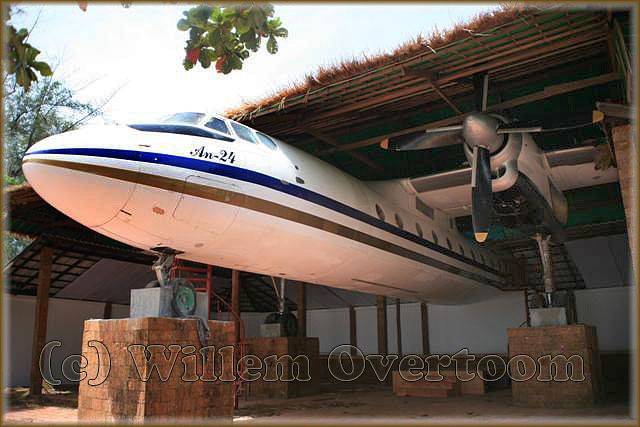 It will serve at its last resting place as a decoration for a restaurant / nightclub here..."
Willem Overtoom also sent this image, the aft fuselage of the An-24 above. This helped to identify it as XU-335. "This is c/n 99902009, ex/ RA-79162." 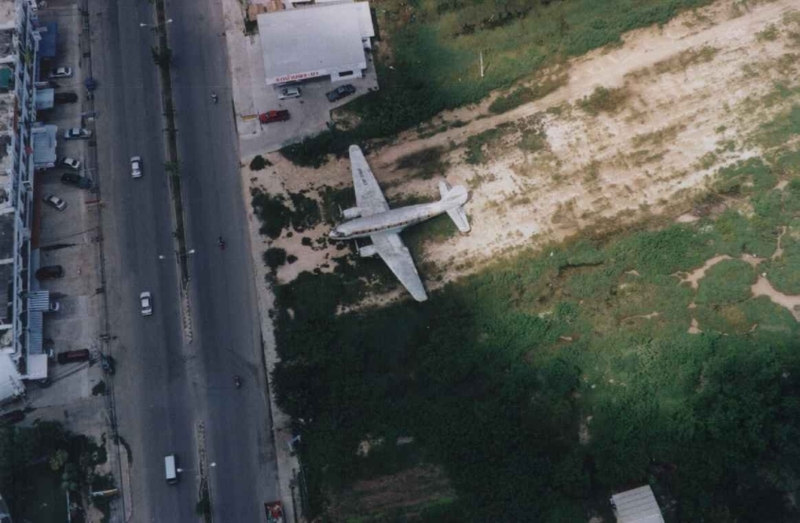 In the Propliner no.141 (2015) was a photo published, with the info that this airframe had been moved again (now all white, no markings), to the top of an appartment block in Sihanoukville. It seemed positioned look out to sea. Phil Brooks forwarded a Facebook post as a screendump to me, fit for my Off-Airport Gallery here! Reading the below Feb.2019 update I have a feeling this is not XY-ADZ, but rather XY-AEW..? 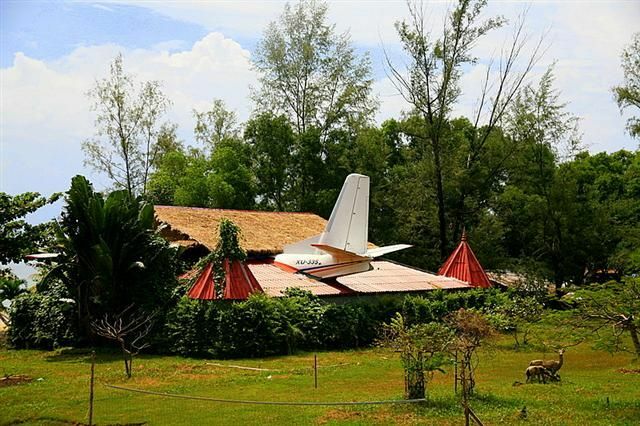 "Union of Burma Airways took its first F.27 in 1963 and over the years that airline and its successors Burma Airways Corp and Myanma Airways flew a further two dozen, of which some 17 were involved in write-off accidents. 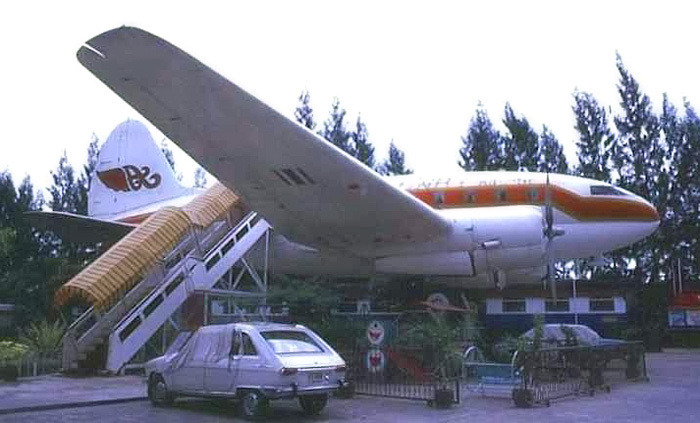 This one was delivered new to Burma Airways Corp in 10.78 (ex/ PH-EXF ¬Webmaster) and was wfu along with most of the survivors around 2005. 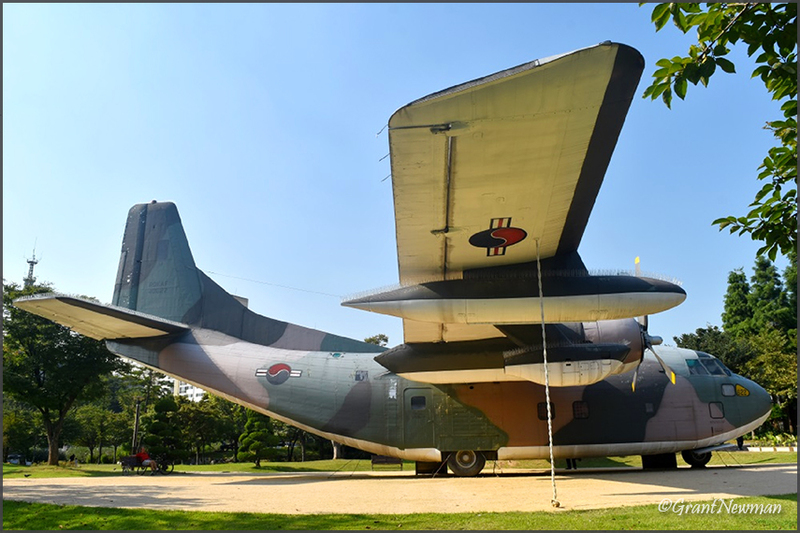 None remain in service and ADZ was towed from the Airport to the downtown People's Park in March 2013 for public display near the incredible Schwedagon pagoda complex." Here's a post on Facebook (Feb.2019) by Petr Nesmerak of XA-YDZ fixed up rather nicely! 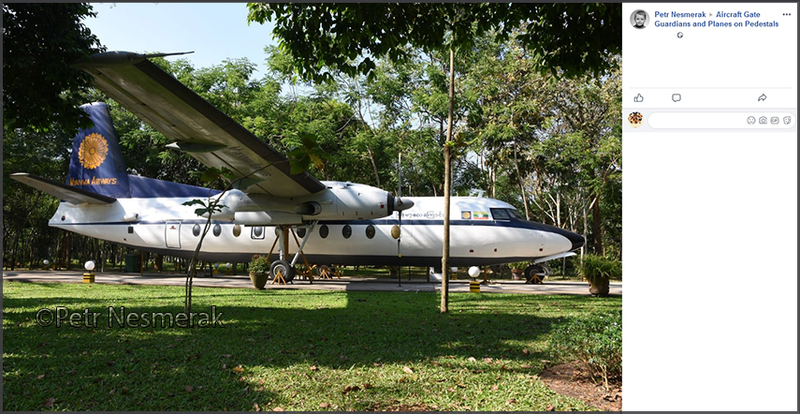 Fokker F-27-600 Friendship, ex/ Myanmar National Airways XY-ADZ (c/n 10574) at People's Park Yangon, Myanmar Date: 7.2.2019; location 16.794575, 96.144305 near the Yangon Planetarium. This is the same park, the civil Fokker F.27's are a little south in the park. 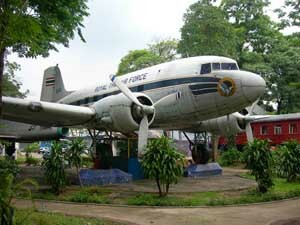 "Douglas C-47A c/n 9414 has been on display at the Bangkok National Science Centre for Education for several years. 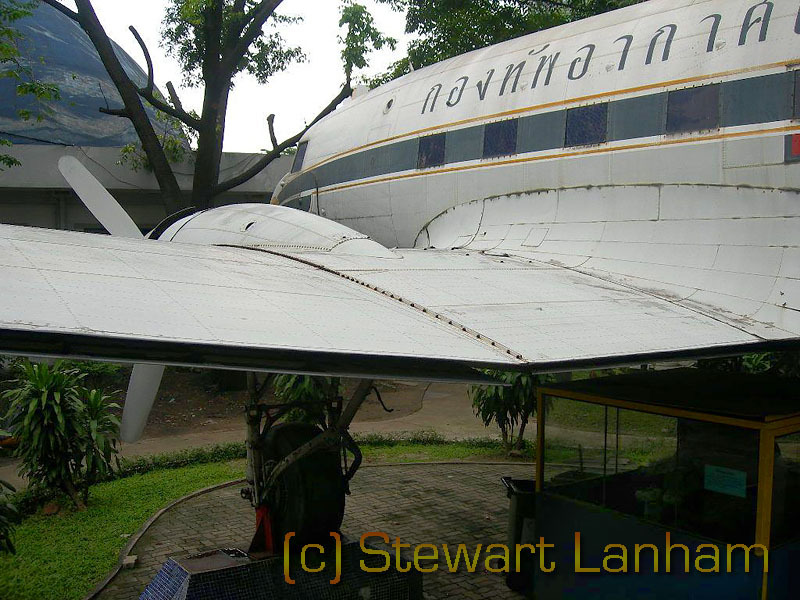 This aircraft was formerly 42-23552, arriving in Thailand for Thai Airways then transferring to the Royal Thai Army. 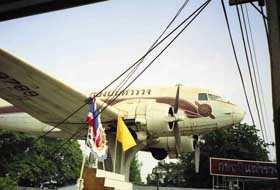 It is displayed as 9414 in Royal Thai Air Force colours. The location is on Sukhumvit, adjacent to the Ekkamai bus and Skytrain stations. The pPhotos were taken on 28Aug07." Its previous identities were 42-23552, FD868, G-AGHN, VH-BZB, HS-TDF, 223552 / 9414; the latter two for Thai Airways and the Royal Thai Army (9414 is also its c/n). "It wears a fake '979' serial but this does not fit with any known Thai civil or military C-47s serials or construction number. It does bear a striking resemblance to the location seen in the mystery photo...! 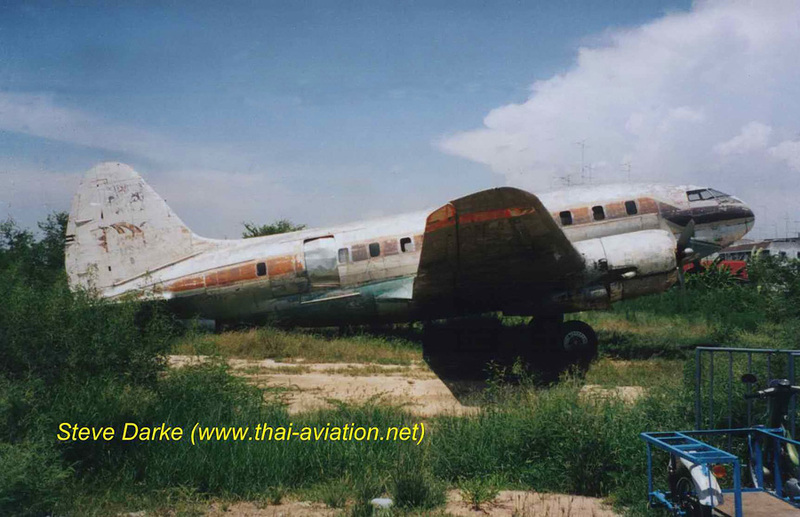 The text with the photo by Ko Stuik translates as: "The Thai Dakota Association obviously has some problems, seeing the location and condition of their DC-3 Dakota.The photo was taken on May 30th, on the north side of Bangkok." 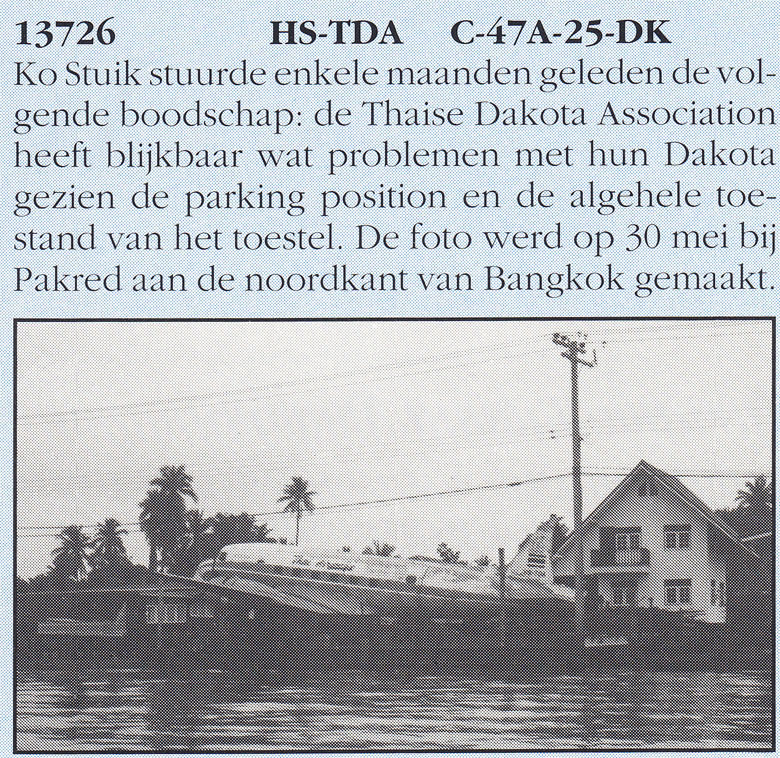 Paul v.d.Horst, of the DDA magazine editorial team, advised me ".. photo was taken 30th of May 1991, according to DDA Magazine of December 1991." 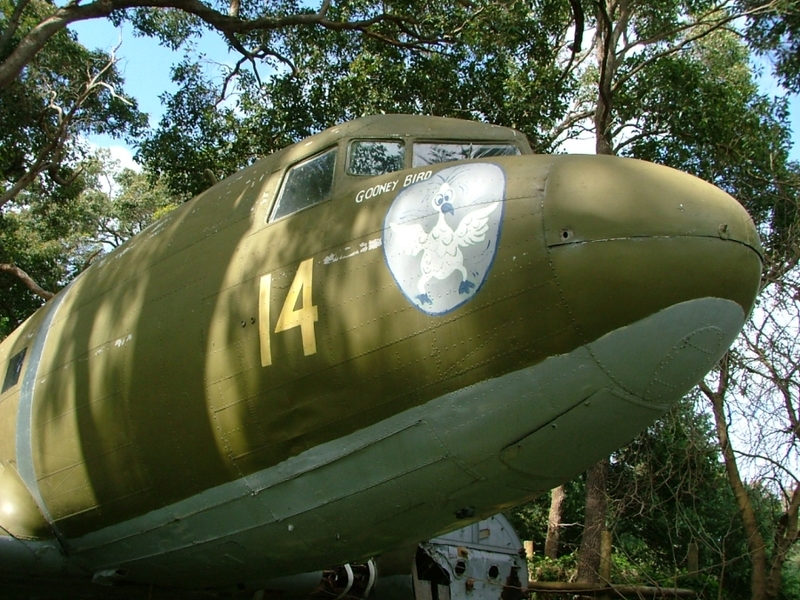 "Believed to be c/n 26777, this Douglas C-47B has been on display at the Royal Thai Police museum for many years. This aircraft was formerly 43-49516, a Vietnam veteran before arriving in Thailand for the Royal Thai Air Force, then transferring to the Royal Thai Police. It is displayed as 219789 in Royal Thai Police colours. The location is on Ram Intra, near to Don Muang airport. The aircraft is mounted above the gatehouse to the Police airfield. Other museum aircraft are displayed just inside. The photo was taken on 25th January 1999. 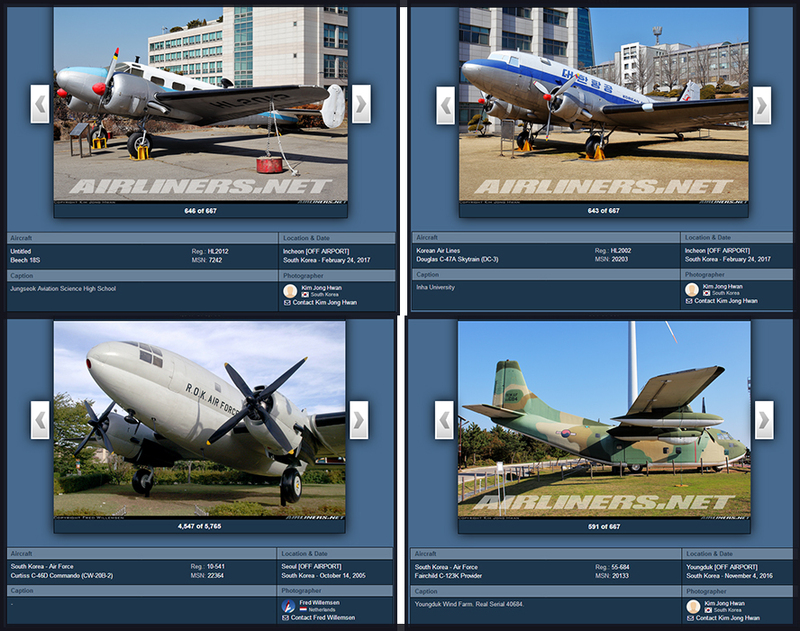 Steve Darke, of www.thai-aviation.net fame, helped me on these images of Curtiss C-46 Commando HS-SKD (c/n 22561). 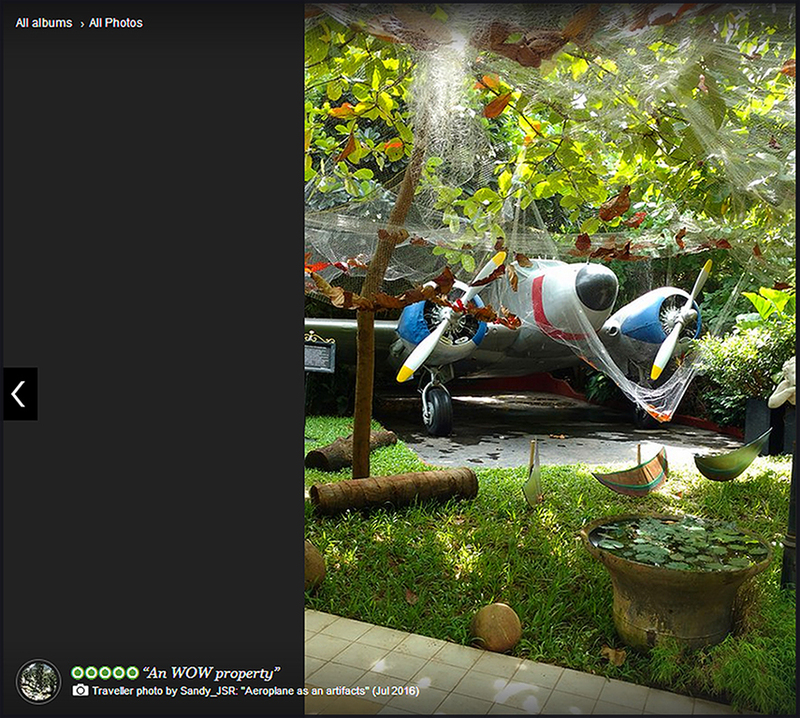 The photo on the right was made by (©)Iain Hutchison when it was on Lat Phrao, Bangkok as the Apichart Restaurant. It was at this location since 1985 at least, reported first as a coffeeshop, later as a restaurant (but that may have meant the same). This photo of HS-SKD was made by (©) Steve Darke himself, when it had moved to Chonburi, late 2001. C-46F 44-78738 c/n 22561 was leased (with 5 others) by Skyways International Trading & Transport Co (Miami, Fl.) from USAF on 19May48, and Skyways registered it as NC1649M on 02Jun48 (with incorrect c/n '2505'). The registration was formally changed to N1649M on 01-Jan-49, and the c/n was corrected to 22561 on 14Feb49. 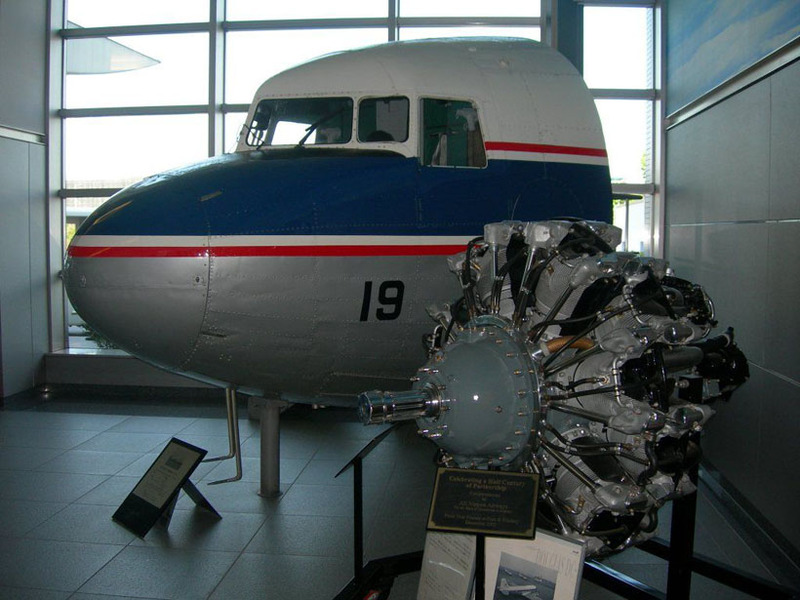 Noted with Ttl 152:27 hours on 18Mar50, N1649M was leased (with 2 others) from USAF by Seaboard & Western Airlines Inc (New York) on 21Mar50 and registered to them on 30Mar50. The USAF lease moved to Slick Airways Inc (Burbank,CA.) on 14Jul52, and N1649M was registered to Slick on 28Jul52. Slick bought N1649M on 30Nov56 before selling it to AAXICO Airlines Inc (Miami,FL.) on 09Sep57 (registered to AAXICO 11Sep57). AAXICO sold N1649M to William N. Hahn (Miami,FL.) in Nov64, and he registered it on 22Dec64. It was noted at Shannon on major overhaul by Shannon Repair Services Ltd in 1965, presumably prior to its sale by William N. Hahn to Caraibische Lucht Transport Maatschappij NV (Willemstad, Curacao, Netherland Antilles) on 01Jul65. An export CofA was issued on 19Aug65 on sale to Netherland Antilles, with a ferry permit applied for on the same day for flight from Miami, Fl. to Curacao, Netherland Antilles. N1649M was cancelled on 15Sep65. It became PJ-CLC with Caraibische Lucht Transport Maatschappij NV until they sold it to Millard C. Berry (Miami,FL.) (who was listed as CLTM’s General Manager) on 16May67. PJ-CLC was cancelled on 19May67, and registered immediately N1447 to Millard C. Berry. A CofA was issued to N1447 on 07Jun67. Millard C. Berry sold N1447 to Continental Air Services Inc (Los Angeles,CA.) on 08Sep67, and it was fitted with ferry tanks in USA that month. N1447 was cancelled 10May74 on sale to Laos, where it became XW-PMF with Royal Air Lao. 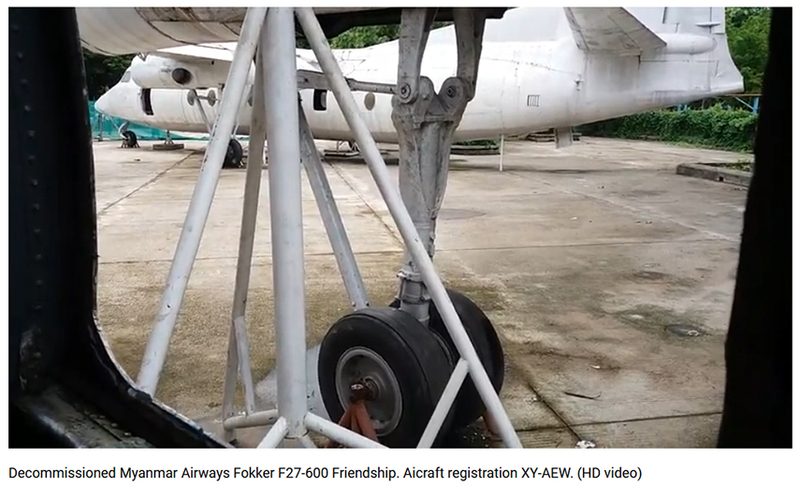 XW-PMF escaped from Vientiane to Bangkok on 24May75, and remained stored at Don Muang as XW-PMF until painted as HS-SKD in 1978, being registered as such on 17Nov78 to Sahakol Air Cargo (which later became Bangkok Airways). 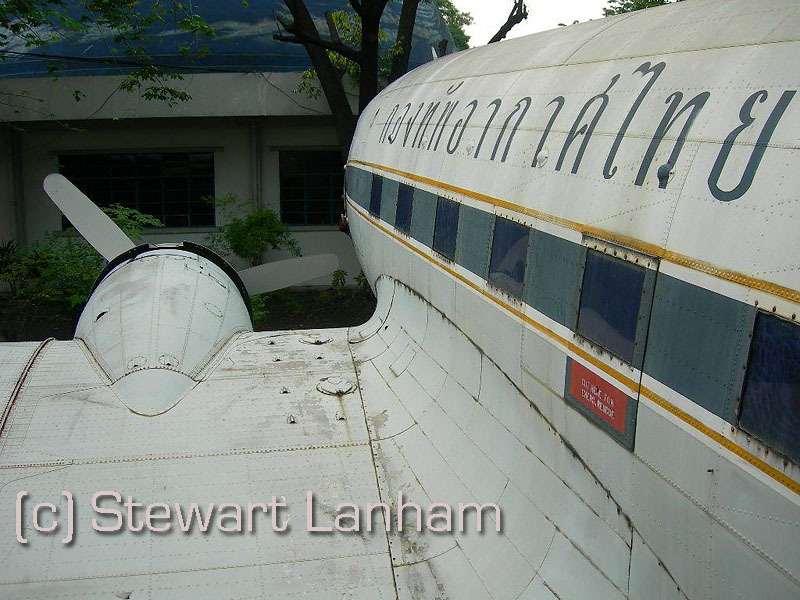 It did not enter commercial or cargo service, was cancelled in Apr80, but remained stored at Don Muang until at least Jan84. By 1985 it had moved to a location on Lad Phrao road in the northern suburbs of Bangkok to become 'Apichart' coffee shop. It remained there, although wasn't open for long as a coffee shop, until moved south to Chonburi in 2001. In may 2017 I couldn't find any more updates after 2006 of HS-SKD. 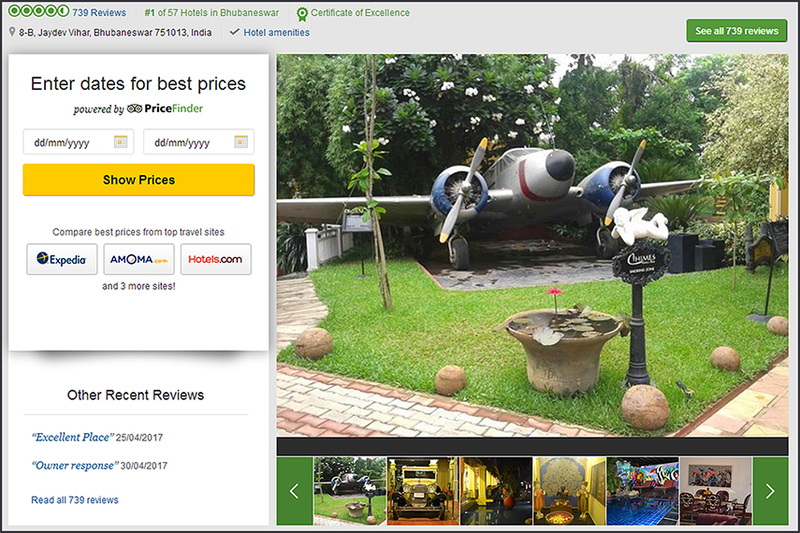 I did see the note "Mark the dogs, guarding the plane"..
And it is for sale! And it too is for sale! Photo © Jack Hannen; published with permission. RP-C1132 (cn 22571) at Cagayan de Oro, Philippines (14Feb06). 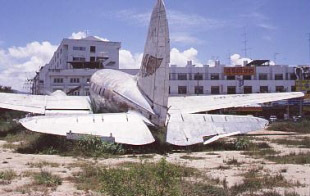 Former USAF, Flying Tiger & Astro Air Transport Inc. Impounded for many years and later withdrawn from use in 1989 at Cagayan de Oro's Lumbia Airport. She now is on display as the prominent façade of a local diner. 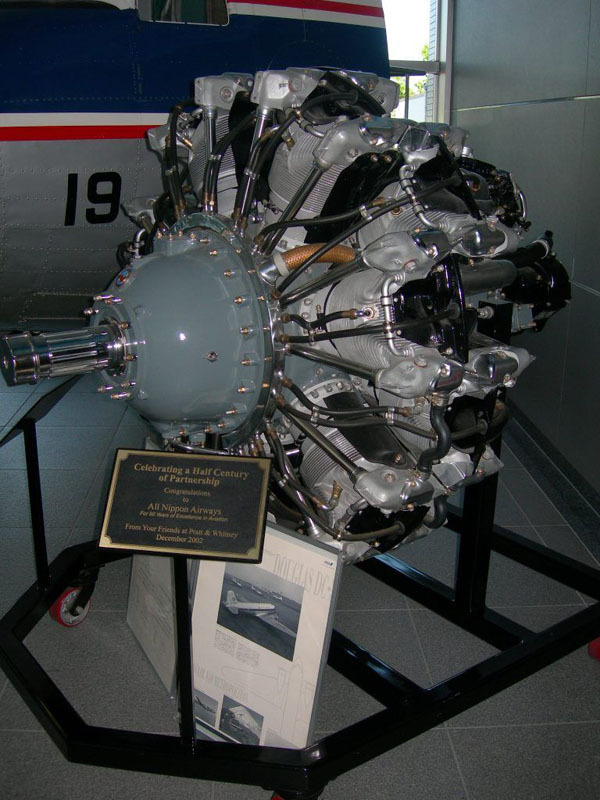 Though the wings are real, the engine cowl is a fabrication and propellers are from a small aircraft. Click on the image for the link and larger image on Airliners.net. 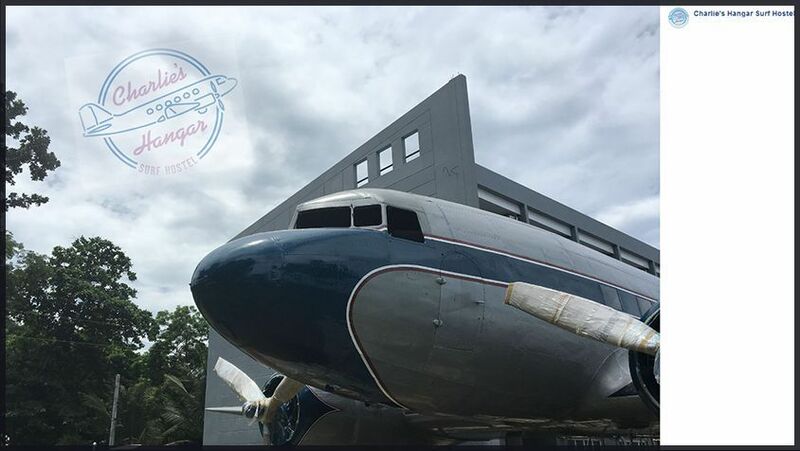 Two Douglas DC-3's reside at a hostel in San Juan, the Philippines! 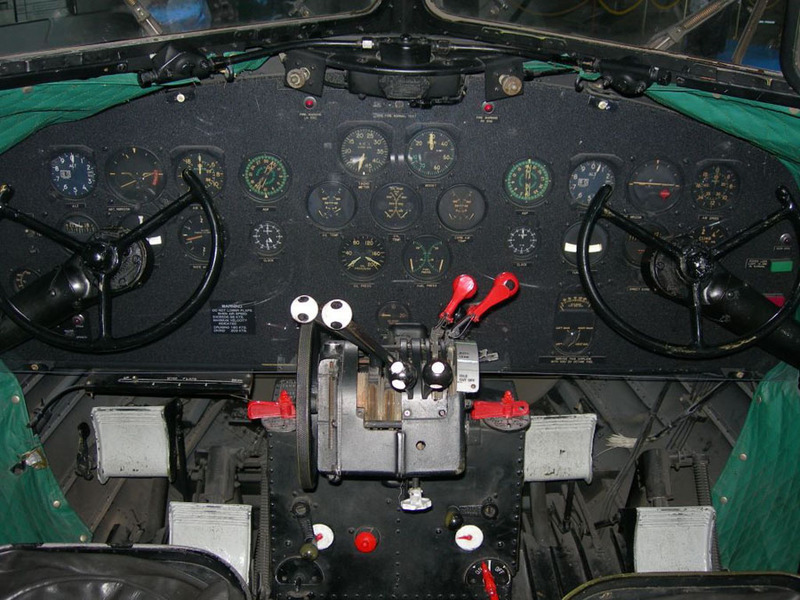 The owner is the son of the former owner of these Douglas piston transports, C.M Aero Services (Charlie Miller). 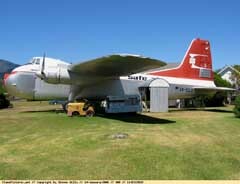 AW.650 Argosy ZK-SAE is preserved at a bar/restaurant at Blenheim-Woodbourne,NZ (last reported Jan96). Photo anyone? AW.650 Argosy ZK-SAF (6801) was reported in 2004 to be at Woodbourne, New Zealand; its fuselage with landing gear is located at a farm. Photo? More details & pics on Phil Treweek's website. 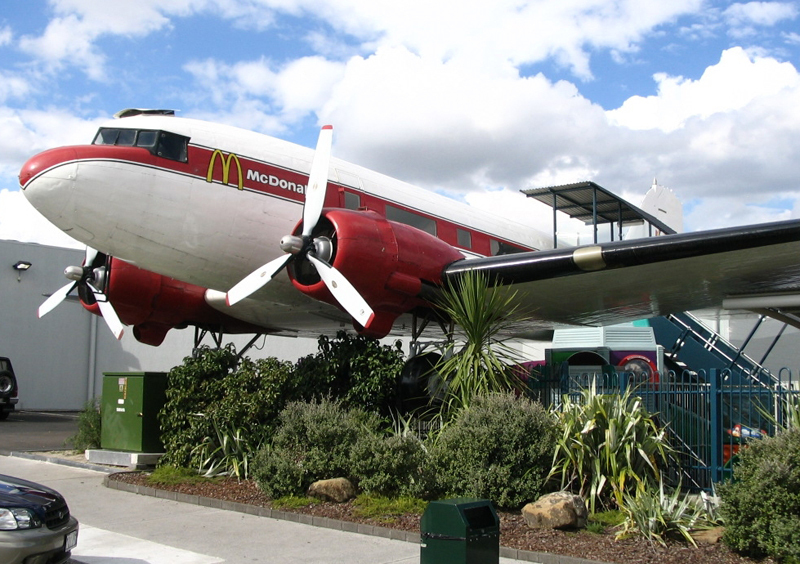 Phil wrote in Nov.2007: "I photographed the aircraft both when it was on a farm behind RNZAF Base Woodbourne in 1998 and in 2000, after it moved down the road to the cafe. When I first photographed ZK-SAE what was left of ZK-SAF was pointed out to me in the distance, but I wasn't able to photograph it. I drove past ZK-SAE back in July this year and she's looking pretty good - but as I had a ferry to catch, I wasn't able to stop..."
Bristol 170 Freighter NZ5906 (13059) has been converted into a 2-room accommodation at Woodlyn Park, Otorohanga, New Zealand. Photo was taken by Bill Blanchard on 26mar06. 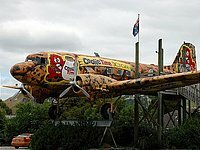 This is ZK-CLU, a Bristol 170 Freighter (c/n 13156) at Nelson Founders Park, New Zealand. Click on the image for a larger photo; taken by Steve Mills 14Jan06. First flight of this Mk.31M was on 02Dec53. 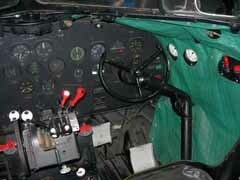 It was bought by the Royal Pakistan Air Force and delivered on 22Dec53. Next it went to Straits Air Freight Express Ltd and registered ZK-CLU (1966); it became converted to Mk.31E. That company was renamed SAFE Air asper 31Oct67. At some point it was put up in storage. "Allocated G-18-148 22Dec53 for Bristol Aeroplane Co.Ltd. ; manufactures date 22Dec53; delivered 1954 RPAF - serialled S4403, coded 'A'; delivered 01Jun66 Auckland for Straits Air Freighter Express; reg ZK-CLU 01Jul66 to SAFE; entered service 03May67 named Merchant Buccaneer; renamed Safe Air in 1967. Final flight Cook Strait flight 26Sep86 (crew S. Petersen, L. Gollop); final SAFE commercial flight Sep 30, 1986 Christchurch - Invercargill - Woodbourne (crew T. Allen, R. Guard, G. Batchelor); wfu 30Sep86 (21314hrs, 25978 cycles); delivered 20Nov86 Wakapuaka for Nelson Founders Museum - landed on Wakapuaka sandflats, aircraft belly landed after a bridge over a creek collapsed, wings removed then towed to Museum; reg cancelled 04Dec86; reassembled and on public display." 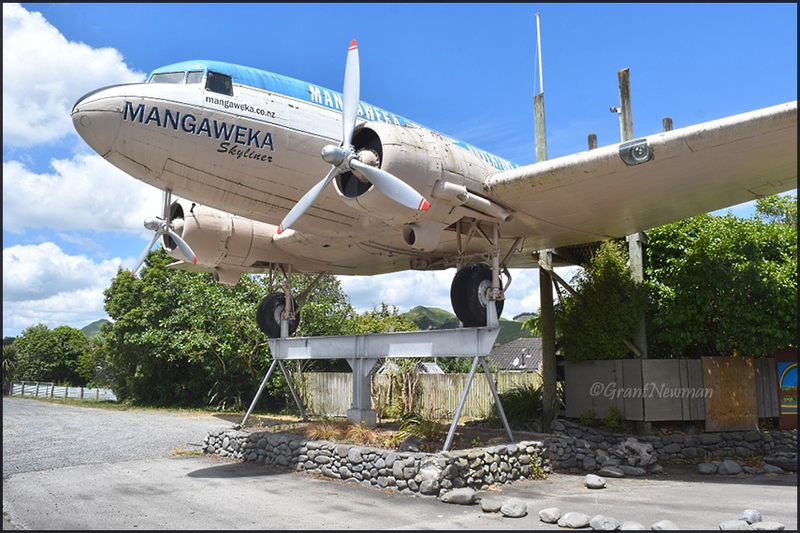 Other Bristol Freighters surviving -partially- in New Zealand can be found at the Ferrymead Aeronautical Society: ZK-AYG and ZK-CRK on Air Britain's Photographic Images Collection (AbPic). 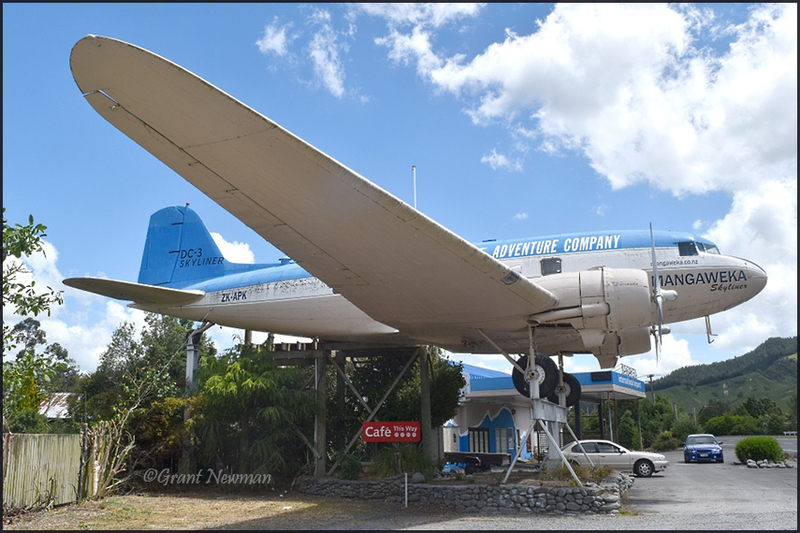 ZK-APK (cn 34227): a different life for this DC-3 on State Highway 1 at Mangaweka, New Zealand. 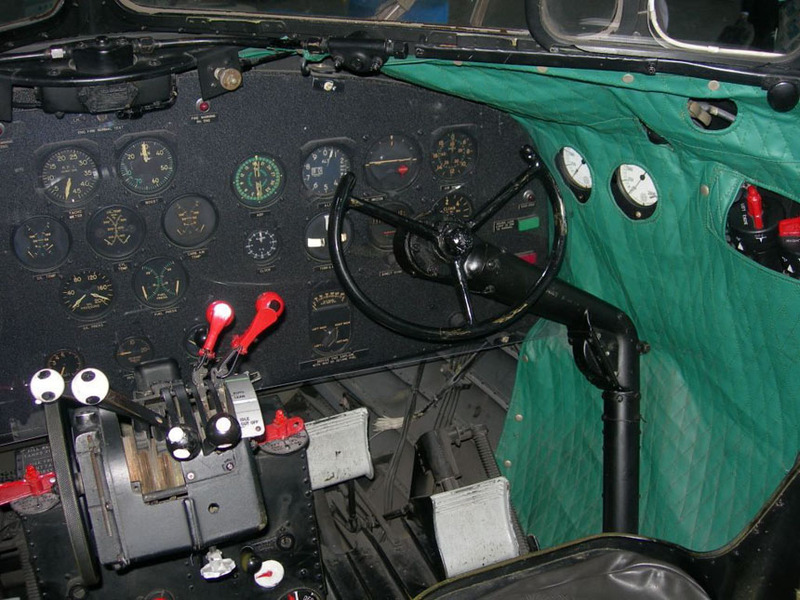 "Had a look inside this DC-3 today while driving from Bulls to Waiouru in the North Island of New Zealand. Owner John Eames was telling me that one of the aircraft's former engineers visited for the weekend recently and took out all visible corrosion and then a painter touched up all the necessary paintwork. ZK-APK is in remarkably good condition considering it has been outdoors since 1986. Have a look at the above website (A.net); if you look up the port side interior you will see a series of photographs depicting ZK-APK's history. That was my idea back in 1987 which I discussed with John Eames at that time. The entire project concerning ZK-APK has been a great success." www.flickr.com/photos/ruthann/sets/72157623797641676/ it shows large 'Adventure Company' - 'DC-3 Skyliner' and 'Mangaweka'-titles. Grant Newman sent me these photos (Exif data show 13Dec17) of ZK-APK with 'Mangaweke'-titles. Grant wrote: "About the DC-3s at cafés here in New Zealand. The Mangaweka International Airport Café is currently closed and won’t be open for at least 8 months. The wooden entrance walkway to the DC-3 is currently being worked on, so the aircraft is inaccessible. It looks like it needs a bit of a clean, too. The Taupo McDonalds is, of course, open for business and by the time I reached Taupo, at around 5:30pm, it was packed for dinner! The DC-3 is only open for dining between 10am and 4:30pm, so I missed out on eating within it. 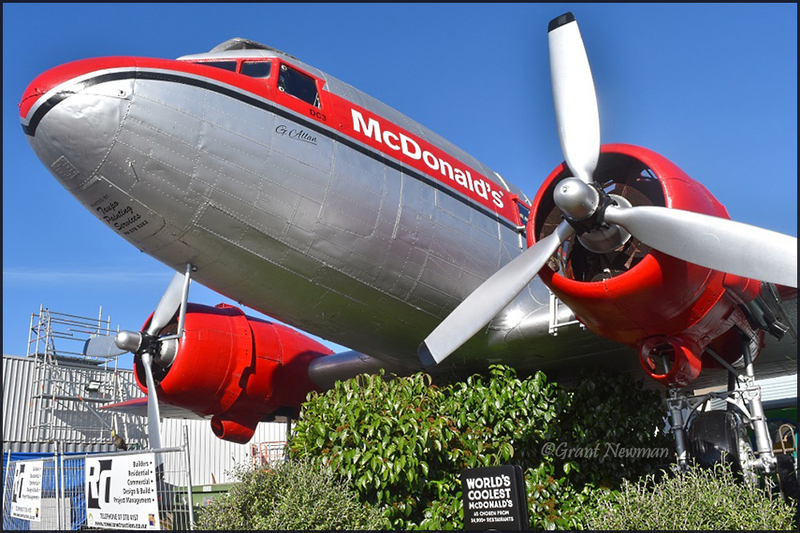 Note that on the sign next to the aeroplane, the Taupo McDonalds has been voted 'the coolest McDonalds on the Planet', out of some 35.000 restaurants around the world!!! No small wonder for a lakeside tourist trap in little New Zealand!" 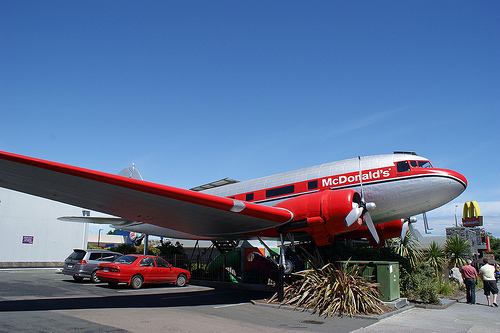 David Ellis sent me this photo (published with permission, © D.Ellis, 06Mar05): McDonalds DC-3, ZK-CAW, located near the lakeside at Taupo, New Zealand. The inside is fitted out for burger eaters. It's been there for many years. C/n 18923 - delivered 15oct43 to USAAF as 42-100460, continued on to Brisbane (07Dec43). Registered 06Feb47 as VH-ANM for Australian National, named "Yannana". Then to Queensland A/L Ltd (named "Darling Downs") registered on 04Feb56. 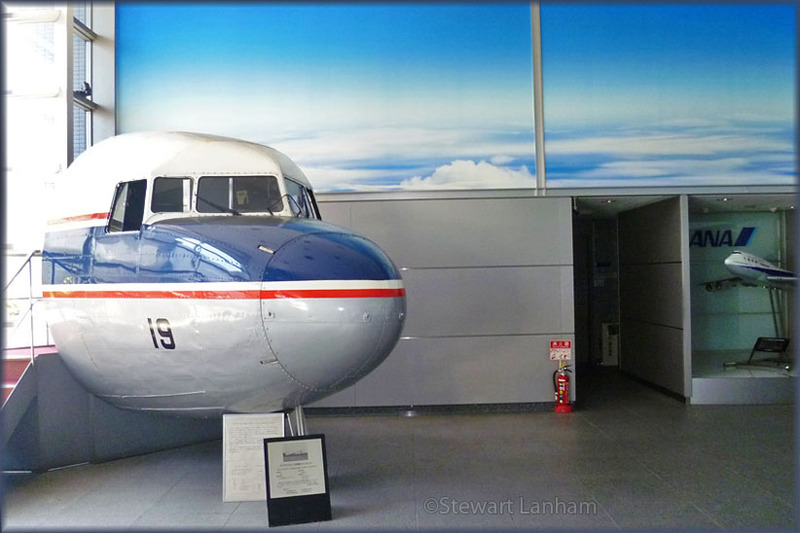 On 07Dec58 it was registered to Ansett-ANA and a few years later, on 14Feb61 it moved to Airlines of NSW. It became registered ZK-CAW for South Pacific A/L of NZ (named "George Bolt") on R28Sep61, changing to NZ National Airways (still named) "George Bolt" on 28Feb66. Qantas leased it from 12May66 and tailnumber VQ-FAI was applied for Fiji A/W, delivery on 06Jun66; it was reregistered ZK-CAW again, for NZ Natl on 05Aug69, the lease obviously ended. Then Mt Cook Airlines leased it, from 05Aug69, returning at some point to NZ National. South Seas A/W had it registered on 07May71 and Fieldair Ltd (trading as Airland) had it registered on 13May71. Gil White offers the following history of ZK-CAW. Photos on Flickr.com, taken 14Feb09, showed a fresh paintscheme! My Photos by Friends & Guests #47 has a 2016 update by Terry Fletcher! McD restaurants around the world! Gerben Tornij sent me these photos, made © by Jos Heyman, of Douglas C-47A c/n 20041 located at Armadale in Western Australia. This is the history: early 1946 this C-47A was bought by the Koninklijke Nederlandsch-Indische Luchtvaart Maatschappij (KNILM) and registered DT-971. For use of operating from the Dutch East Indies to Australia the radio callsign VH-REY was painted on the aircraft. In Aug. 1947 the aircraft transferred from the (military) ML-KNIL to the KLM, but it remained in the Dutch East Indies; its tailnumber changed to PK-REY. When Indonesia gained its independence from the Dutch, PK-REY was handed over to Garuda, which changed the tailnumber to PK-GDC. In 1971 PK-GDC suffred an accident at the airport of Broome, located in northwest Australia. It remained since then in Australia. 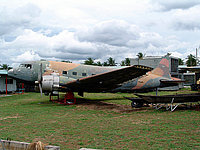 For years the C-47A served as decoration to the Tourist Bureau of Broome, but after 1980 its condition deteriorated. 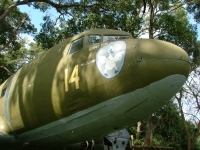 Around 1995 PK-GDC was bought by the Western Australian Museum of Aviation and the aircraft was transported to Jandakot Airport; here it was painted in the drab USAAF camouflage paintscheme. Unfortunately, the plans for the museum were never fully realized. 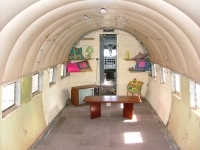 In June 2002 the aircraft was again offered for sale with the remark: Ideal for conversion into bus/caravan !. It did not come that far, but the fuselage was sawed in 3 pieces to make it suitable for roadtransport. PK-GDC was sold to Peter Hanbury of Armadale, W.A. on 23APR03. 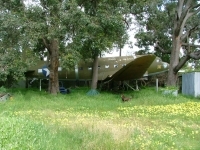 During May 2003 the aircraft was dismantled and trucked to the property of Jeff Green at Armadale, W.A. Here it was put in the garden of the new owner, serving as a spare bedroom and highlighting gardenparties. Unfortunately the left wing was not attached as it would end up in the neighbours yard! These photos were taken on 02Oct05. 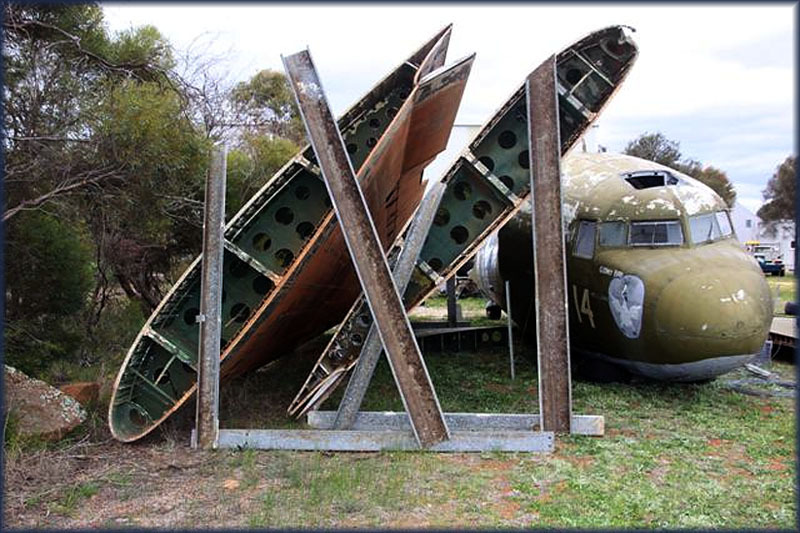 "The aircraft was moved over the weekend of 1st / 2nd September from Armadale to Amelup ( north of Albany) in the Stirling Ranges where it will be restored and act as an attraction outside the Lily Dutch Windmill restaurant / accommodation complex. 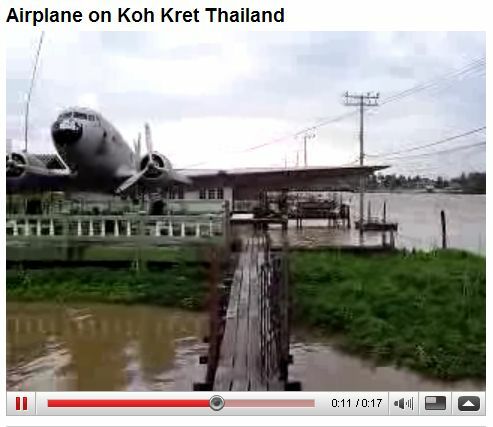 See the photo of the aircraft on arrival at Amelup." 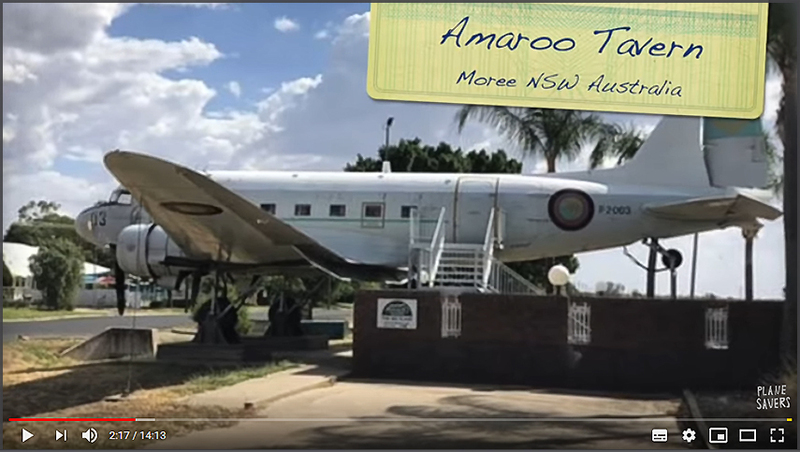 DC-3 Amaroo Tavern in Moree, New South Wales (NSW) - almost 500 kms from Brisbane. I came across this DC-3 in a Plane Savers episode (E83, march 2019, contributed by Martin). The livery is still that of Papua New Guinea (PNG) Defence Force. Seems this DC-3 (C-47B, c/n 26638/15193) is now marked P2-003 / 03. I have a note that it used to sit on a pole here in Amaroo,NSW. I hope it has a long life here at this pub! 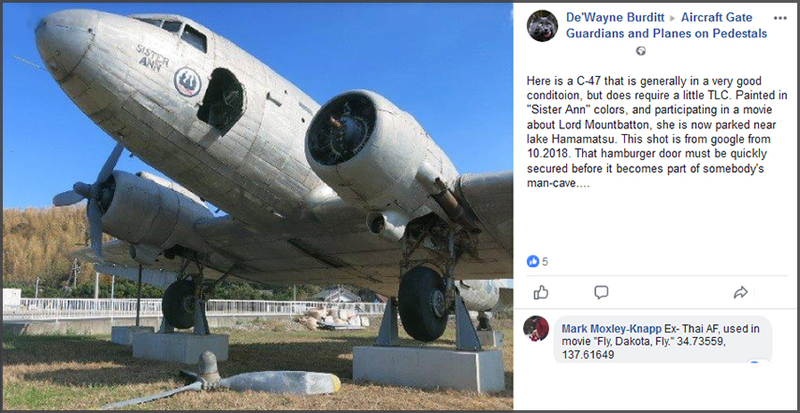 There is a 2011 photo on Flickr (FlashFlyGuy) from where I copied this history¬..
'This C-47 Dakota S/N 43-49377 was delivered to Australia in January 1945. It was inducted into the R.A.A.F. as Aircraft No. A65-67 Registered VH–CUX. She served in many different squadrons including the School of Air Navigation at East Sale. 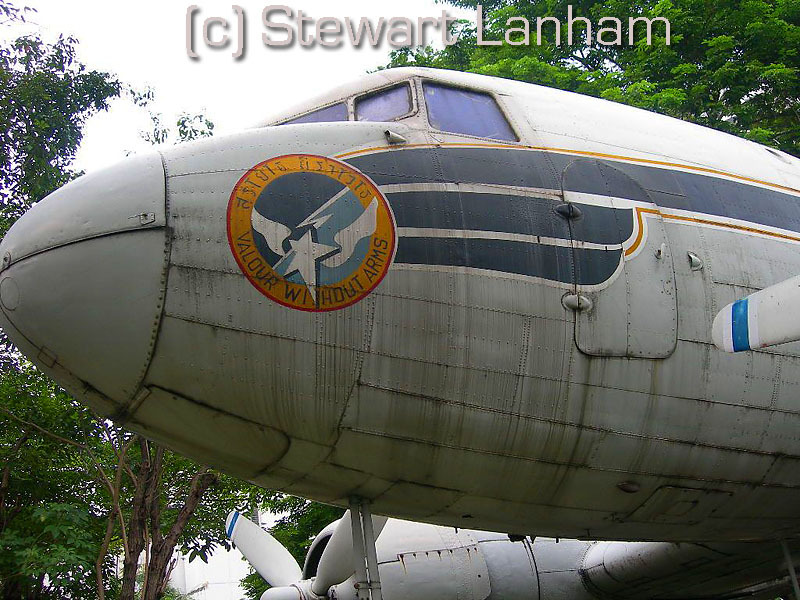 In 1975 the Australian Government converted A65 – 67 to a Civilian DC-3 and on the 10th October 1975, handed her over to the Papua New Guinea Defence force, in the name of foreign Aid, where she was given the Aircraft No. P2-003 with the call sign 'Defence Force 3'. She gave approximately 5.000 hours of service to the Papua New Guinea Defence Force until she was pensioned off on the 11th February 1992, when the Port Engine developed a massive oil leak and had to be shut down in flight by the pilot, Flight Lieutenant Tim Shaw R.A.A.F., who landed safely at Port Moresby. 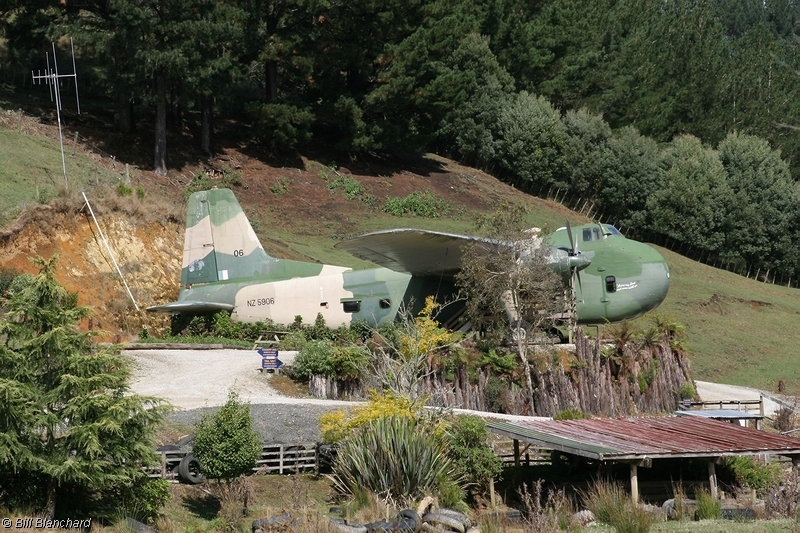 This DC-3 was bought by tender from the Papua New Guinea Defence Force in July 1993. The aircraft was flown to Moree in two stages by Captain Reg Perkins and First Officer David Kilin. The 1st flight was conducted from Port Moresby to Cairns on Saturday 21Aug93 and took 3 hours and 20 mins. The 2nd flight took place the following week with an additional crew member. Marty Taylor, the proud Owner, and the duration was 5 hours and 13 mins landing in Moree at 7.10pm on Saturday 28Aug93. 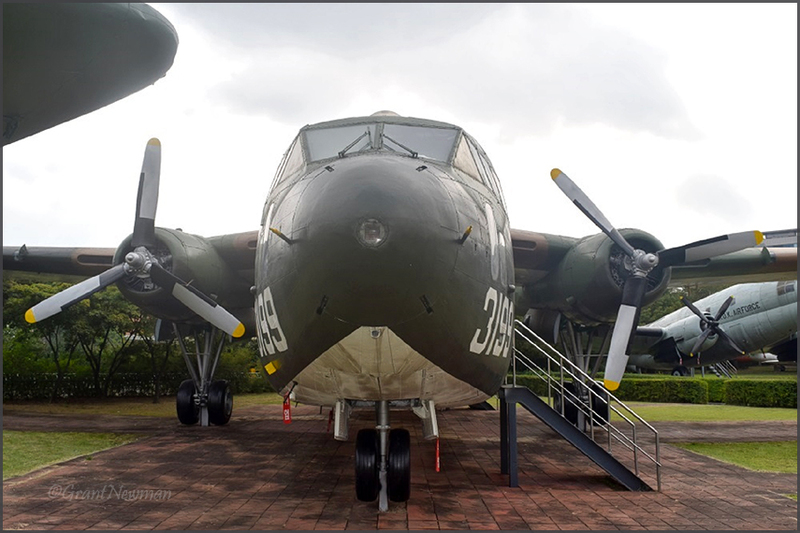 After a lot of preparatory work including swapping the engines with another, DC3 VH–SBL, P2–003 was towed through 3 fences and 2 roads to the car park of the Tavern where it sat for 2 months while the foundations for the P2-003 were put in place. The aircraft was finally lifted into place by three cranes on Tuesday the 23Nov93.